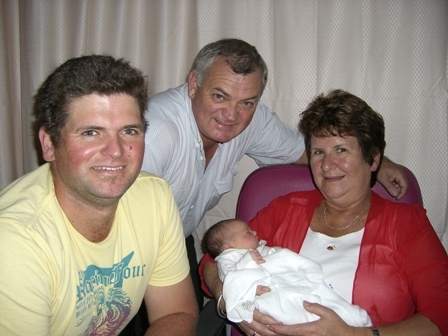 Paul and Denise Sandow welcome their first grandchild Angus - son of Brent and Ainslie. Sorry Denise - no girls yet... Congratulations to the Sandow family. 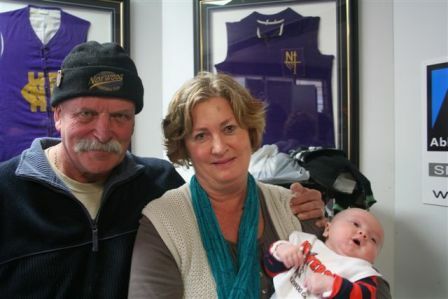 Life Member Barry Newland and wife Dot welcome their first Granddaughter Celeste, daughter to Ross and Rana. In breaking with tradition, a 'Girl' has entered the Newland household for the first time except of course for Dotty. Congratulations to the whole family. We need emails and phone numbers of all past players that may not be in touch with Norwood. There are a lot of past players from 2005 to 2008 who we don’t see and we want back to the club. It is our aim to target this generation, so any details you have please forward to us at norsemen@norwood.org.au. The Norsemen, PP&O are always looking for pictures, articles anything from yesteryear that is of interest to the many people who visit the web site. If you have any memorabilia we are more than happy to have copied and posted back to you at out our expense. It is also an opportune time on Past Players Day (second home game of every season) to bring your memorabilia along for all to look at. We have listed a players games section on the site noting all players and the games played. The records have been compiled over the last three years however we know there are more players to be listed - if you know of anyone who is missing from the list please contact us and we will investigate and have the player inserted onto the list. Likewise we are trying to have all players contact details entered onto our data base - again please forward any contact details, email address, phone numbers etc to us and we will follow up. Membership of the Norsemen, Past Players is most welcome. Please go to the membership section of the site for further details.